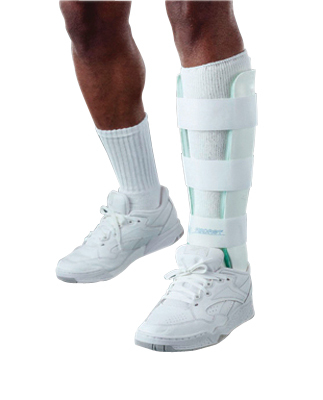 Leg Brace designed to provide functional management of stress fractures and the graduated management of certain stable fractures of the lower leg. Features anatomically designed shells lined with the patented Duplex aircell system. Brace is 15.5" high. A sock is included with each brace. 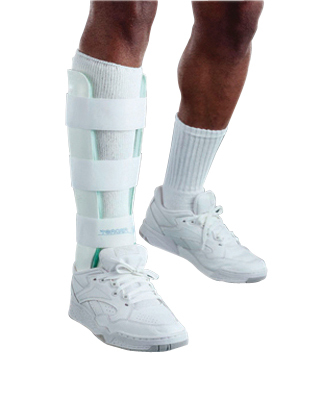 Dimensions: 17" x 3" x 4"
Leg Brace designed to provide functional management of stress fractures and the graduated management of certain stable fractures of the lower leg. Features anatomically designed shells lined with the patented Duplex aircell system. Brace is 15.5" high. Includes anterior Panel for additional tibial protection. A sock is included with each brace. Dimensions: 11.5" x 2.5" x 4"
Leg Brace designed to provide functional management of stress fractures and the graduated management of certain stable fractures of the lower leg. Features anatomically designed shells lined with the patented Duplex aircell system. Brace is 13" high. A sock is included with each brace.